This picture is an example of a charcoal drawing made by Claude Buckle at the outset of the Second World War. It a true marine picture showing in detail ships in a convoy in the Atlantic swell. 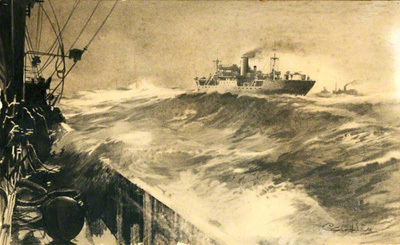 The picture is drawn from the deck of one of the ships with the sea shown is spilling over onto the decks. Claude manages to capture the true atmosphere off ships at sea in this rare very early drawing. Created in 1931. This shows an enlargement of the boat in the background.